Hey mate, I appreciate all the advice and suggestions. I am struggling a bit however with how in depth this seems to be running. People out there are successful at keeping shrimp in their tanks without half the knowledge we are throwing around right now. So I question whether my true and biggest issue is that I am trying to keep the wrong species of shrimp in a tank that just isnt stable. I have had two more shrimp die yesterday, and I haven't touched the tank or altered anything. So I believe the damage is done and these shrimp are beyond saving. I will wait for my shrimp tank to cycle and perhaps have a run at more compatible shrimp for the conditions I am creating. Most probably crystal reds. I am glad this thread now exists as I will be able to use all this great advice if I have issues again. So I believe the damage is done and these shrimp are beyond saving. Animals and plants are amazingly adaptable. They can handle a wide range of temperature and PH. If you look in the currently running heater thread I am seeing temperatures of freezing to 85F. IN death valley there is a small fish living in a small stream that does reach over 1100F in the summer. IN the winter it can probably drop to 40f. At one time I always did my ph check always in the morning. And it typically was 7. However one day I did it late in the evening and found it at 9. It took me a week to figure out what was going on.and correct the problem. Did I loose any snails, shrimp or fish? No. Did I loose any shrimp do to the iodine deficiency I had, No. So In my experience the damage is not done and is possibly reversible. And since the new tank is not yet ready why not spend a few dollars for some iodine and baking soda and try it. Either they will die or they might continue living for a long time. And if it does work you could have a thriving colony once you replace the females. If you just move everything over to the new tank when it is ready the problem might go away or might get worse. When I got my shrimp did I ever use drip acclimatization? No, didn't even know about it until after I got shrimp. Did I ever loss a shrimp after adding them? Only the first ones (calcium deficiency) 50% water change? I do that once of week since I got the tank. Special substrate? No, is inert quartzite. What is my KH? 20ppm, and the PH is stable at 6.2 . The only issues I have had were plant growth and fertilizer related. Seachem comprehensive only working intermittently in my tank. Now I am making my own macros and micros and the plants are doing very well. Each tank is different and it does take some experimentation to find out what works and what doesn't. But once you get past that you watch and enjoy it. The issue being that I am experiencing and even inducing KH swings basically rules out bicarb. Iodine, understandable and potentially possible in this instance. I cant fight my substrate l, it's going to end in tragedy every time. However, I know this now, therefore it shall not happen again. I know animals are resilient, and I am not writing these shrimp off. I am merely stating that I see some washed out and stressed shrimp in a tank that requires high co2 and ferts. Will I have shrimp in this tank again, no probably not. So whilst I hope I can keep them alive, I am accepting that what I've basically done it kill a whole batch of shrimp a matter of months. Water change today with SS GH+ so maybe this will begin the path to success. We shall see. One problem with RO water is that it is often cleaner than the cleanest streams and rivers. This can cause problems. The nutrients plants need are well known. However if you look at the nutrients animals need there are some major differences. Animals need sodium and iodine, selenium, cobalt, and possibly bromine. Now plants can grow and reproduce without out these minerals. However if the water, substrate, and food don't have these the health of the shrimp can suffer. No one here is recommending straight RO water though. I have two remineralizers. Description: Aqualex mineral conditioner contains unique formula hwich can reduce the oscillation during changing water. Offers aquatic animals essential minerals, especially Calcium and Magnesium for shrimp shell growth; other minerals assist shrimp pigmentation and survival rate. Description: ShrimpMineral contains all the important minerals and trace elements your shrimp need for their well-being, an intensive colouration, successful breeding and healthy growth. It also furthers plant growth and the microbial regeneration of biological filter substrates. Neither say specifically what is used, but people still have success having plants and shrimp in a tank using shrimp minerals. 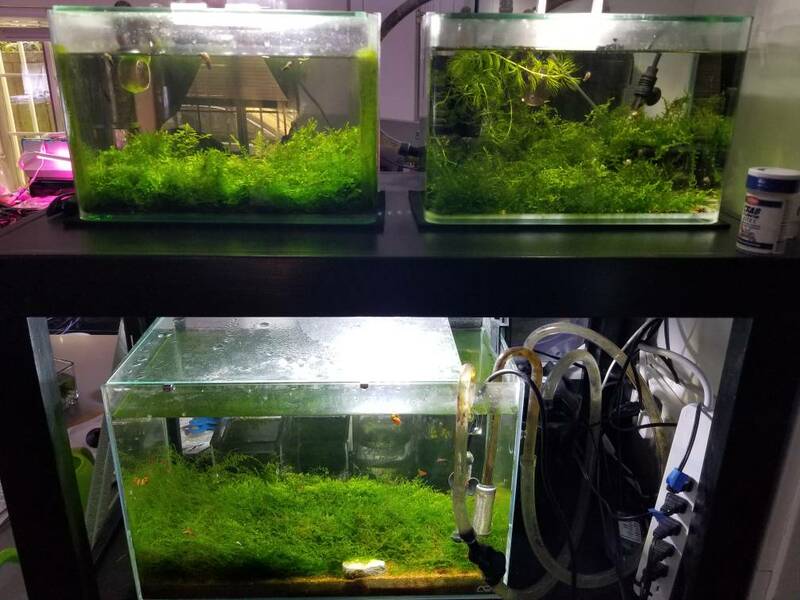 Now, if a person wants to take it a step further, they can also purchase plant ferts, some of which are even designed for shrimp tanks. I would recommend you try adding salt sodium chloride or use sodium bicarbonate to control your KH. many aquarium products today use potassium bicarbonate. If you use table salt I would try starting at 1ppm. Considering the tank has ADA soil in it, it is not recommended to add KH to it, and this would further cause stability issues that the OP is already dealing with. Also, table salt is *NOT* recommended due to the anti-caking agent in it. I haven't researched much into it either, but I've also heard it's not good for the plants and some fish species. Have you considered altering your dosing regimen for the plants to a method where you can do smaller water changes? With a buffering substrate that alters water parameters and using tap water, maybe switching to PPS dosing and doing 10% water changes could help a lot. So did you hear a fact or speculation? Why didn't you do some research before posting a potentially incorrect statement? There are a number of anti caking agents used. Some haves carry names Sodium ferrocyanide. but if you look at the ingredients labels some use sodium bicarbonate or calcium silicate and other silicates which are perfectly safe. In fact I have morton Iodized table salt in my kitchen. According to the label is has Calcium silicate dextrose (a type of sugar), potassium iodide. Why they put sugar in it I don't know but it is not dangerous. but the calcium siilicate is not water soluble. It is essentially powdered rock, and potassium iodide is the common source of iodine. These all make up a very small portion of salt. So a tiny percent of a 1ppm NaCl dose is going to be,,,nothing to worry about. Does it have enough iodine? Don't know. Will it effect KH no. The plants also might be ago to use the dextrose as a source of carbon. If a person gets too much potassium and not enough sodium they could have a heart attack. Iodine is add to salt because iodine deficiency was once a common problem. In fact in some places today it still is. Somewhere else I saw a chemical analysis don on it. Basically it is calcium, magnesium, potassium, chlorine, and sulfur. If there is anything else in it it didn't show up in the analysis. In short it is basically the same as most GH boosters on the market. Following advice from others on my tanks dosing schedule I had already changed my methods. But this included basically a 25% water change at the end of the week. I have 1/3 the amount of ferts entering the water column and have yet to find the sweet spot to be honest. Yesterday was maintenance day, gave the tank a clean and a water change. Also giving phosguard a go to tackle some algae, will see the outcome soon I suppose. Water change was done with GH+ only, got the dGH up to 9 with a rough tds of 190. This is 50 below my tanks tds. But due to ferts and organics, the number is always higher at weeks end. Just so it is out there. I slowly replenish water that has been temperature matched. As for this salt argument. I cannot weigh in and will let the experienced and educated solve that one. For right now, no salt added. So you are saying that not all table salt is the same... therefore it's not a good idea to recommend table salt, generally speaking. That's not to say that all table salt is bad, but a person should need to know what is safe vs is not safe to use. Honestly this has taken a huge hit to my confidence, I've never failed at keeping anything alive this terribly. I want to do well, but it seems this batch of shrimp is most likely destined to fail. Don't let it bother you - I think we've all accidentally killed our fair share of livestock. The only real way to know that you are succeeding is to accept that you've failed and do the best that you can to improve your methods. (Such is life in general) IMO, keeping a planted shrimp tank is more difficult than keeping a fish-only marine tank. It honestly makes my marine tank seem like a breeze. Once you get to the point where you are successfully keeping a planted shrimp tank, you WILL feel incredibly good about it. And remember - if this was easy (and cheap, haha), everyone would do it. There's a reason that so few people tackle the responsibility of keeping such a micro ecosystem in their home. I've run probably close to 3 dozen different RCS and blue dream neocaridinia tanks. I've run a lot of different types of tank set ups including low tech shrimp only up to ultra high tech mixed fish + shrimp and have even run a 75gal community tank with full grown angelfish and a small RCS colony. Here are some of my thoughts based on my experience, which you should take with a grain of salt since anecdotal evidence is just that, anecdotal. They should be very well fed. Bacter ae 3x per week. Shrimp pellets, algae wafers, supplemental blanched veggies. I hope they are starved. Some fish flake in there too. No predation, only housed with 10 cory habrosus, almost the same size as them. Stress, probably a factor I agree...just not sure why. Should be noted that I kept this batch of eggs in a container with an air bubbler. Here's hoping, but I doubt anything will come of it. I'm still skeptical that the berried female is not getting enough to eat. Just because the nonberried females are eating well does not mean that she is eating well. Unless you see her out in the open all the time and also hanging out with the hasbrosus, stress from malnutrition 2/2 fear from predation is highest on my differential. I think it's safe to say though that your tank is (was) doing well though since your shrimps were breeding to begin with. Neos won't berry unless they are doing well. This is why I think something is selectively pressuring your berried females. I'm thinking this tank just simply isn't compatible with shrimp. Which is fine, once I get this other tanks cycle complete. 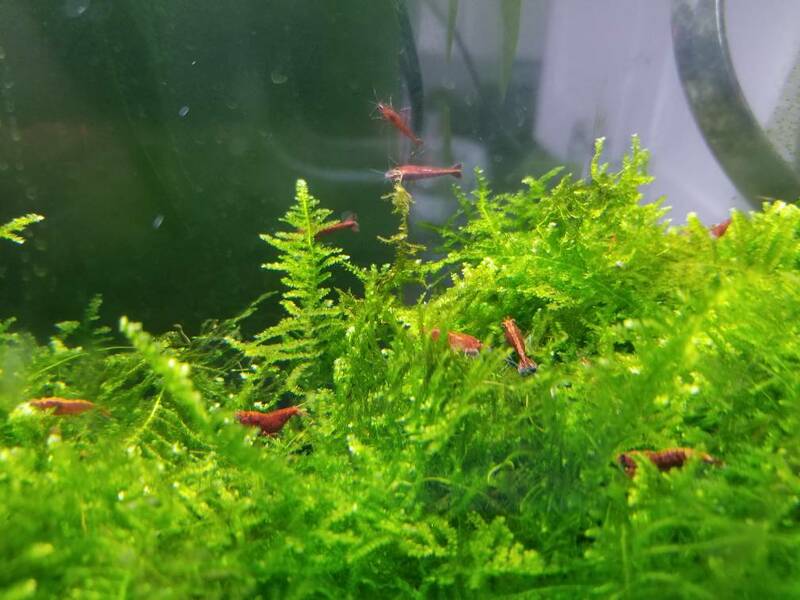 Re: Shrimp in low pH.... there are people keeping shrimp in tanks where the pH is in the 5's and I might have heard of someone even keeping shrimp in a tank in the high 4's??? SL-Aqua buffering substrate, RO water and GH minerals. Prior to changing out the substrate, the pH probably was around 7.5 ish. The API kit registers a 6 pH now, and it's brand new. I've had the kit for less than a week. I then used my Sera kit to test the pH and it's saying about 5.5 pH? Tank has Bloody Mary, Yellow King Kong, and a Caridina Sp (looks like amanos, but not). All were in the tank prior to switching out the substrate. I did not acclimate them or even let the tank settle.... I literally emptied the tank out, rinsed it with cold water, scrubbed 3 walls, threw in the new substrate, refilled with remineralized RO water and GH minerals with plants, then dumped the shrimp back in. I only know for sure that I've lost one shrimp, and it was a Caridina Sp. (the not-amano). I've been struggling with Neos, regardless of where I get them or what type (Cherry, Yellow, Bloody Mary...), what water I keep them in (straight tap kills them, RO and minerals didn't really improve survival after trying remineralized tap - diet change did work until two separate people unintentionally killed off several shrimp within 3 weeks....) so if I lost them then I lost them. So far, the bloody mary are still doing okay as far as I can tell. It's been at least 3 weeks since I changed out the substrate. 1) I have always had limited success with shrimp that I've bought online. In fact, I've always had limited success with shrimp that I've bought in large quantities. My definition of success is net population growth in 3 months. Success was always limited by frequent and chronic die offs of the original stock like you have been experience (except not isolated to berried females). I cant say for certain since it's been a while since I've had die offs like these since I changed my stocking practices, but I want to say that females (both berried and unberried) preferentially died over males. My hypothesis on the two major contributing factors were (1) age of bought shrimp and (2) quantity of shrimp bought. FME, subadults and juveniles are the best to buy since they are more adaptable to tank parameters and need less food to feed. Nowadays, I don't add more than 1 shrimp per gallon per week to my tanks. You'll read everywhere about how shrimp contribute almost no bioload, but that only includes the biowaste that they themselves produce. If you feed in excess or feed really messy foods without frequent water changes, you're stressing the biofiltration on the tank. This is most evident when you set up a new tank that "has been cycled" and you add in 30 shrimp. Enough messy feeding w/ inadequate tank maintenance and you'll push your tank into another mini- or (or even full) cycle. 2) I've run over 90% of my shrimp tanks on ADA Amazonia and ADA Malaya. Aquasoil is buffered to a pH of 6.8. Malaya is buffered to a pH of 5.5. KH for both is kept at <1. Source: The Book of ADA (I highly recommend this for anyone who uses ADA products). In general, you shouldn't be trying to fight your water and soil parameters. So adding KH buffer to ADA soils seems like a bad idea overall. 3) I don't use Bacter AE and have had success to the point that I basically dump extra shrimps at my LFS or in my community tanks for Darwinism. The food source that has made the most difference for me is switching pretty much exclusively to Shirakura shrimp ball food (it's the hard algae wafer/crisps). I like it a lot because it seems nutritious to my shrimp, it doesn't make a mess when it's getting torn apart by the shrimp, and it can sit in the tank for almost a day without any noticeable fouling of the water. 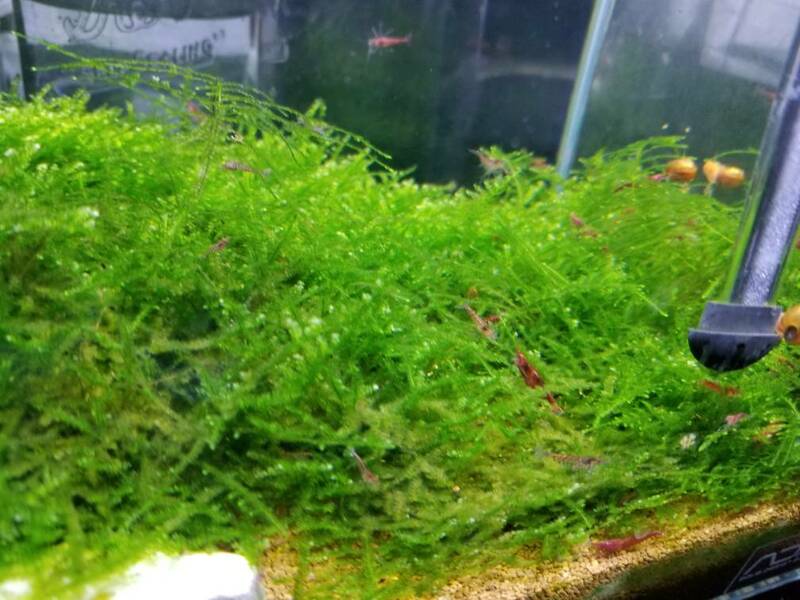 I also make it almost mandatory to keep moss in tanks with shrimp. A nice loose baseball of java moss or xmas moss or a nice 4x4 of mini xmas is the minimum I try to aim for. 5) CO2 has only been a problem for me when I've gassed my shrimps. Once gassed to the point that the shrimp look confused/drunk, I pretty much assume they are going to die even if you reverse their hypercapnia (they end up dying in a week or so, probably from long term consequences of the acute CO2 poisoning). Shrimp barely need to be fed, especially in a planted tank with even traces of algae. Overfeeding kills them faster than under. I think this depends on the size of your colony with respect to the size of the tank/surface area of the tank. 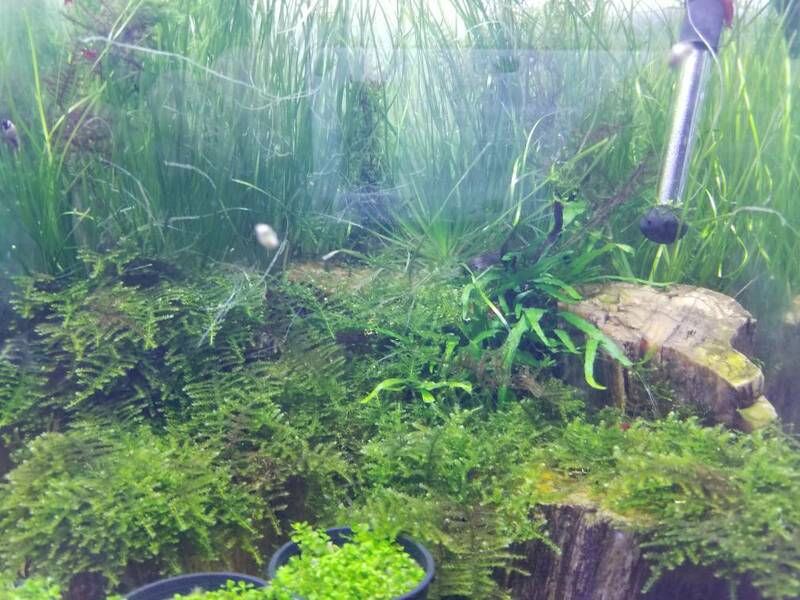 Heavy moss tanks probably don't need much external food supplementation per shrimp. Planted tanks with mostly stem plants alone wont sustain a large colony without external supplementation. I have to concur though that overfeeding is extremely detrimental to shrimp. If you don't do good water maintenance, the food will foul up water, cause ammonia/nitrite issues, and even bacterial blooms. You are not going to isolate variables in your current tank and neither has the person giving you their anecdotes. Ditto, so you should also take my thoughts with a grain of salt. Buffered Substrate, fluctating kH, fluctuating TDS, those are known to stress shrimp. Stressing shrimp doesn't mean you kill them, they can adapt but you aren't going to ever know how well. Yep. But if your shrimp are berrying, you're doing something right. Bottom line you won't know what is killing your shrimp until they are in their own tank where you hardly touch the water or parameters, don't add CO2 and have everything stable, and even then you are changing their water parameters from old to new ank and some could die in the new tank anyway. However they are easy to breed so if the new tank has no fish and good water conditions they will breed and the babies born in that tank water will be much more resistant. I run CO2 and have good results, until I accidentally gas my tank and have to reset things. I also agree that the new babies born in your tanks are better adapted to your tank parameters than the ones you buy. This is why I hate getting full grown adult shrimp from others. Given this, I actually always keep a low-tech, high-moss nano breeder tank in case my show tank populations suffer an extinction level event. 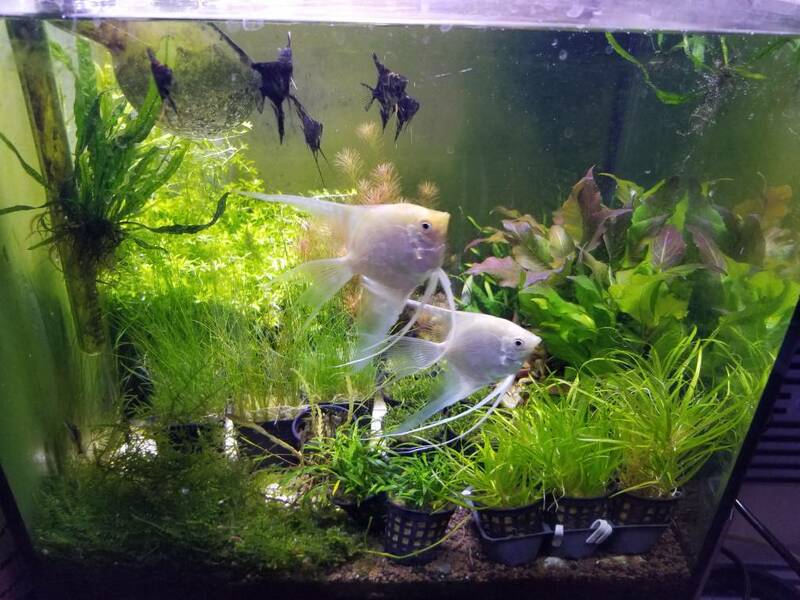 I run a 2.4 gallon with about 20 full adults and transfer over a few sub-adults and juvies every week or so to my other tanks. People keep neos with 50% water changes, CO2, buffered substrates, but its always a case by case and often depends on the quality of the stock. Its much easier to eliminate the potential stressors and not to add variables you don't have to like unecessary additives. Neos are highly adaptable and can pretty much survive most planted tank parameters as long as they have time to adapt IMO. 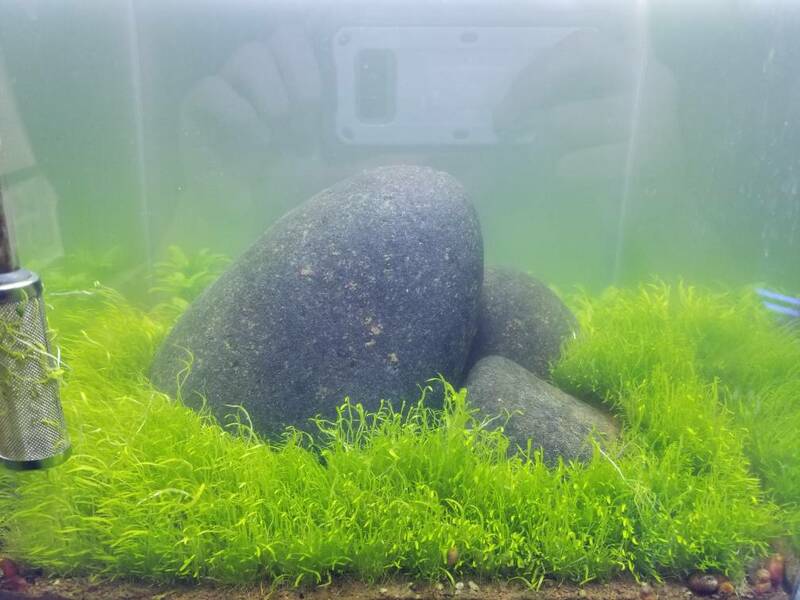 It'll take a generation or two for your line to stabilize with your parameters, but you'll be working against that stability if you're constantly tweaking parameters like trying new mineralizers, changing what water you use for the water changes, changing your substrate, etc. Pretty much all in all of my tanks, I avoid doing water changes and top off with RO water. I average a ~50% water change every 2 to 3 months across all of my tanks. What u should have done when first getting the shrimp - test the water they came in and do a super slow acclimation if the values are very different. What u can do now: Start water change with RO + SS GH+. Turn off CO2, turn down lights. If you follow and believe in Joey (KingOfDIY on Youtube), true acclimation to water parameters usually takes weeks to occur since it requires changes at the intracellular level by the fish, so that the cell proteins can function in new environmental parameters. I can't say this with a lot of confidence, but I would expect this to be true for other parameters like temperature, O2 and CO2 concentrations and possibly GH, KH, etc. The biggest thing you need to worry about in the acute setting are big changes in temperature and O2/CO2 concentration. Moving a fish from warm water to cold water will shock them. Moving a fish from a highly oxygenated tank to a highly CO2 injected tank will also shock them. Not sure if the acute maladaption to wide CO2 discrepancies is due to pH or the actual CO2 concentrations though. I remember reading somewhere about how water pH affects the gills and how well gill tissue can extract O2 from the water and dissipate CO2 into the water. Your tank is not stable which stresses shrimp. They like stable kH and TDS. I hope you can get them out before the rest die. Way too many guesses in here for my liking. Stability IMO really is key. And by stability I mean on the order of weeks to months. I keep shrimp in all of these. First pic, top row are my 2.4gal breeders. 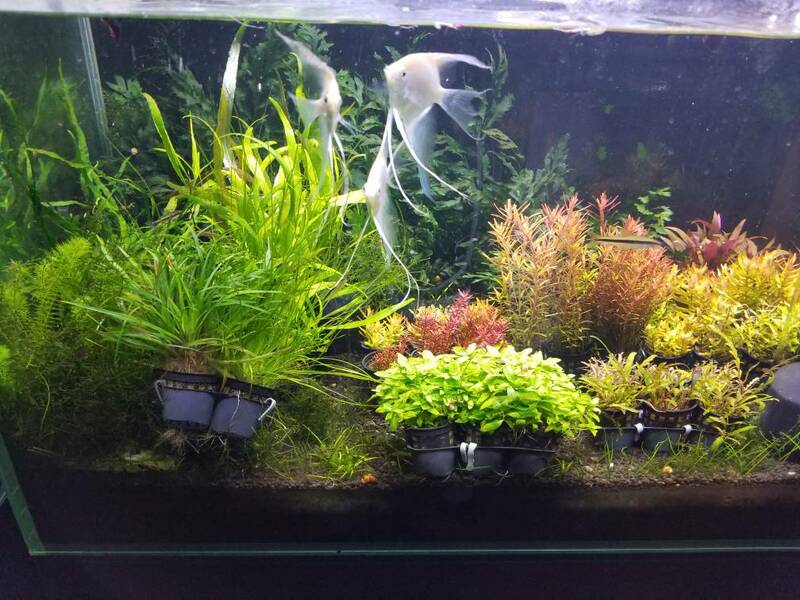 First pick bottom row is my junk RCS tank where I let my culls live in peace. Pics 2 to 4 are close ups of each. Pic 5 and 6 are planted, co2 injected tanks w RCS and blue neos respectively. Recently wiped my colonies because I gassed the tanks by accident a few weeks ago when my room got too hot, but I reseeded the colonies and they are breeding again. Pics 7 and 8 are planted tanks that I grow plants for sale. They both have small RCS colonies from the winners of the Darwin's Game they were forced to play with the angelfish. 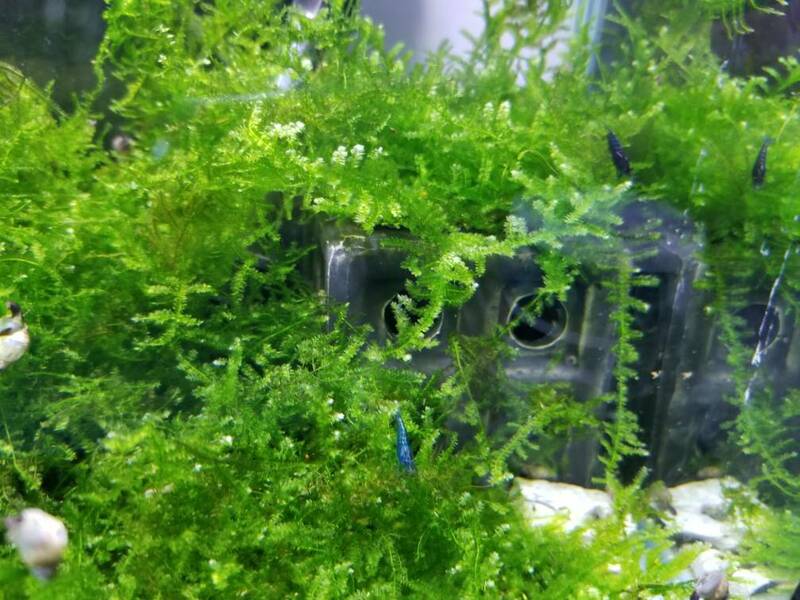 They pretty much just hide in the moss and underneath the plant trays I have in the tanks. cl3537 and Pythos like this.